You might have missed it, because there wasn’t any fanfare. But this country’s small modular reactor industry now has an advocacy group of its own, dedicated to nurturing a flourishing small reactor industry in Canada. The Emissions-Free Energy Working Group (EFEWG), like CNA, is a membership-supported industry organization. Member companies join to create a common voice. It was clear in recent years that regulators like CNSC, and other stakeholders, needed to have a point of dialog with the industry on SMRs – a point of dialog that no one SMR designer/vendor could provide very well by itself. EFEWG Executive Director Roger Humphries has led the conception and creation of EFEWG, which now has by-laws and paid members. EFEWG has already been involved in at least one valuable regulatory research project: INPRO’s “Case Study for Deployment of a Factory Fuelled SMR.” The Canadian team (EFEWG, CNA and CNSC) elaborated a case study of the regulatory problems posed by deployment of a land-based SMR across international boundaries. CNA is proud to have helped in the creation of EFEWG. We will continue to give Roger and his team our support in realizing their vision of a flourishing Canadian small reactor industry. presentation on the margins of next week’s Annual General Meeting of the Organization of Canadian Nuclear Industries on Nov 18 in Ajax, Ontario. This AGM is themed on Small Modular Reactors Development and Applications. OCI is pleased to announce that the Emissions-Free Energy Working Group (EFEWG) has chosen to use the opportunity provided by the OCI AGM and conference on small reactors to hold a follow-up meeting of its own on the work it is doing. All members of OCI are invited to attend. The meeting is free to members of OCI and CNA but organizations are asked to limit their attendance to one or two representatives. The meeting will be of interest to SMR vendors, potential SMR operators, EPCs seeking to build SMRs, safety and licensing consultancies and other supply-chain organizations that may benefit from the development of this new industry that will be complementary to the nation’s CANDU expertise. The vision of the EFEWG, a not-for-profit industry association, is a flourishing small reactor industry in Canada and it is presently identifying what must be done to turn that vision into a reality. In the first phase of its activities it is in a dialogue with regulators, both nationally and internationally, and other stakeholders with a goal of ensuring that a framework for regulation is in place that assures public safety and is appropriate for these new technologies. The meeting will start at 10:00am and will be held in one of the board rooms at the Ajax Hilton Garden Inn. Details will be provided at the conference. The meeting will include presentations by the Chairman of EFEWG, Neil Alexander, and its Executive Director, Roger Humphries, on the activities of EFEWG and will include discussion of work that is taking place by IAEA through its Innovative Reactors and Fuel Cycles (INPRO) program. Asked in the 1970s about the influence of the French Revolution on western civilization, Chou En Lai is said to have paused and replied: It’s too soon to tell. You might say the same thing about nuclear technology’s impact on the world. Sure, we’ve had it for about 70 years. But is that long enough for a fair test? The Newcommen steam pump, circa 1710. Practical steam engines were in use for a century before they really changed most people’s worlds. Steam engines were first commercialized around the year 1700 to pump water out of mineshafts (which they did better than humans), and shortly thereafter to drive textile mills (which they did better than waterwheels). They weren’t successfully applied to transportation (steamboats and locomotives) until just after 1800. Before they could operate on these mobile platforms, steam engines had to get smaller, lighter, safer, more applicable, and far more efficient. When they did this, steam engines dramatically reduced transport costs. That made the world a very different place in the nineteenth century – and in many ways, and for many people, a much better one. The Trevithick locomotive, circa 1803. A recent announcement by Mississauga-based Terrestrial Energy Inc. (TEI) reminds us again that we’ve probably not even glimpsed where revolutionary reactor designs might take society in a carbon-constrained world. Remember, we’ve come less than six decades from the opening of the first utility-scale nuclear generating station – which operated successfully in Pennsylvania from 1957 until 1982. Reactor technology has spent those decades generating cleaner and cheaper electricity than nearly any other source, and probably doing it more safely than any other source. But that’s not the end of the story. Because reactor technology has also spent those decades getting better and better. A number of CNA member companies have designs that reflect this progress, and that could change our children’s and grandchildren’s world in very positive ways. Terrestrial’s is just one example of this. The Shippingport atomic power station. 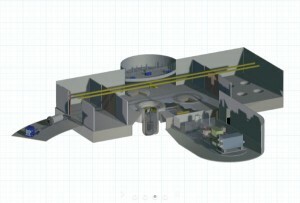 On January 7, Terrestrial Energy announced a collaboration with the U.S. Department of Energy’s Oak Ridge National Laboratory to advance the design of its concept for an integral molten salt reactor (IMSR). Oak Ridge is where early molten salt reactors were proven, decades ago. 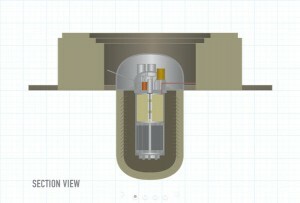 More recent Molten Salt Reactor technology could represent a revolution in nuclear safety, waste and proliferation resistance, and in energy cost-competitiveness. 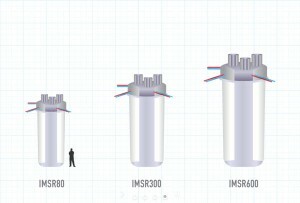 Terrestrial’s is a small modular design, with models ranging from as small as 80 MWth – about one-tenth of the typical utility-scale reactor installed today. The company wants to start commercial deployment of IMSRs by early next decade. Edge-of-grid and off-grid locations in Canada, many of them currently using dirty, expensive diesel generators, could benefit dramatically from these or other advanced and smaller reactor designs. Think nuclear had its heyday in the 1960s? Sure. And the piston engine was just a better way to get water out of coal mines.